After D23 Expo 2017, we now know that there are a lot of incredibly exciting new attractions coming to our favorite Disney parks. Epcot in particular received a lot of attention at the Expo, with their being several huge announcements in regards to the park. Perhaps the most exciting of which, is a new “Guardians of the Galaxy” attraction. This will be the first Marvel-themed attraction to come to Walt Disney World and it will bring the popular unlikely group of heroes to Future World at Epcot. Not many details were announced for the ride, except that it will be an E-ticket attraction and it will be a different experience from “Guardians of the Galaxy – Mission: Breakout!” in Disney California Adventure. 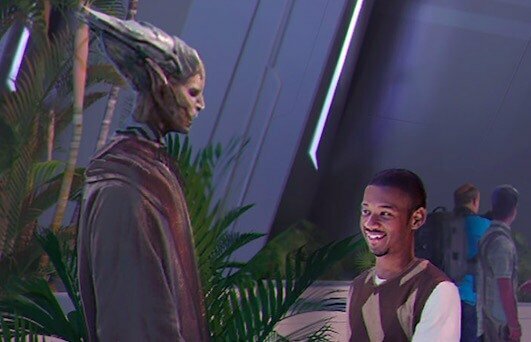 The concept art for the facade of the new attraction is littered with exciting details that could be showing off some impressive future meet and greets. 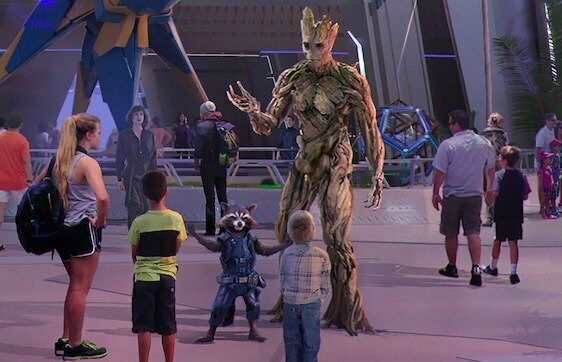 Probably the most recognizable and obvious details would be Rocket and Groot standing front and center as guests make their way to the new attraction. As two of the most popular characters in the franchise, this would be an incredibly popular meet and greet. 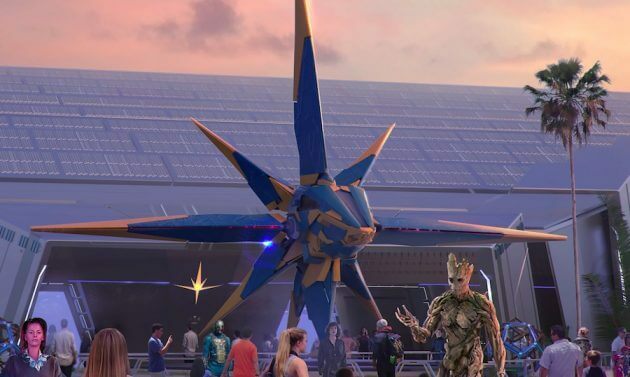 Right behind them is a Nova Corps ship, which you may recognize from the first film. 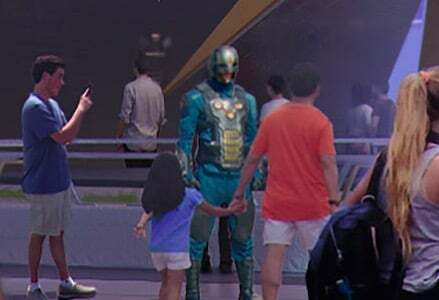 And not far from the ship, is a member of the Nova Corps which could make for a good meet and greet or perhaps a walk-around character, similar to the stormtroopers in Hollywood Studios. Another member of the Guardians is present as well. 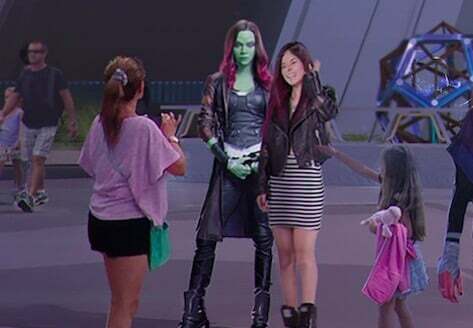 Gamora, who has appeared in Disney parks in the past, appears to be posing for a photo with guests. Along with some of our favorite character, there are also some less-than-familiar faces spread around as well. Fitzgerald may have meant this figuratively, but it is also true in a literal sense. Unfortunately, in order to build a new attraction, often times old attractions have to go. This will be the case here as the Universe of Energy pavilion will be closing for this new Guardians ride. 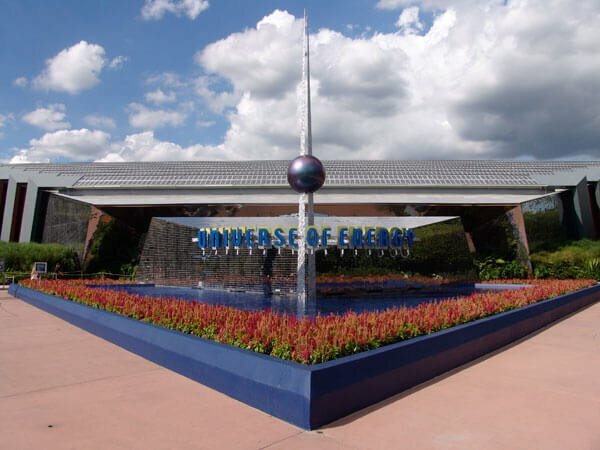 Universe of Energy, which is home to the Ellen’s Energy Adventure attraction, was an original attraction at Epcot. Changes have been made to the attraction, but the building itself has been there since the park’s opening day back in 1982. The attraction, which stars Ellen DeGeneres and Bill Nye, is an educational moving theater attraction based on, you guessed it, energy. This version of the attraction began running back in 1996, surpassing the run of the original version. It is always unfortunate when a classic attraction has to close. However, there is a great deal of excitement in the future for Epcot and this new “Guardians of the Galaxy” attraction is a big reason why. I know Disney gets what Disney’s wants. But I thought they had a contract with Universal made up stating they weren’t allowed to put any Marvel attractions in Walt Disney World Resort because Islands of Adventures Marvel Island? It seems Disney interprets the agreement as applying only to specific characters, the majority of which are affiliated with the original Avengers (Iron Man, Captain America, Hulk, Thor, Black Widow and Hawkeye). There’s also the complex Sony agreement for Spider-man licensing for 6 movie roles specifically played by Tom Holland in the MCU. We have no idea how Tom Holland’s Spider-man fits in with Universal’s right to the character in Parks east of the Mississippi. It seems as though Disney might be trying to create a legal case that IP created within their MCU exists outside of the licensing to Universal (ie, they are not the same characters), and as long as Disney doesn’t touch IP outside of the MCU and bases its attractions off of their own IP within the MCU (backstories, costumes, and films), they may try to begin pushing them into Parks to see if Universal wants to bring a case–who, by the way, may no longer be as concerned now that they have Harry Potter and Jurassic Park. Right now, they appear to be operating under a gentleman’s agreement, with Disney not touching Avengers east of the Mississippi, and Universal not attempting to bring a case against Disney for Guardians and Dr. Strange. 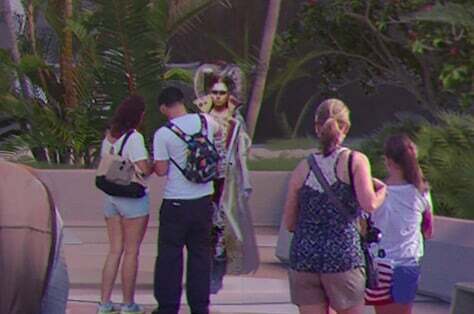 Universal’s theme park rights are limited and never covered the Guardians. They don’t get every character and any new rides have to be approved by Marvel. That’s not to say that Universal couldn’t cause a problem as they almost sued Disney for advertising The Avengers on their monorails (an agreement was reached on that). Unless Disney pays massive money to their biggest theme park competitor in Orlando, Universal is not giving up their rights. Disney would basically have to fund the rebuild of Marvel Superhero Island. Universal also holds distribution rights for The Hulk movies as well when he is the main feature character. They actually had to tread very carefully with Thor: Ragnarok in regards to Hulk. There’s likely some Quid Pro Quo involved here. There has long been rumor that the Doctor Doom FearFall may be removed at some point. Universal would need Disney to approve a new attraction. Universal has been awfully nice not suing for ads and not contesting a Guardians ride at Epcot. So we could see Disney allow for a new Marvel ride at Universal as part of a gentleman’s agreement concerning this stuff. Awesome news! I can’t hardly wait to see it in person in the near future! I love Guardians of the Galaxy!